There are certain things that I love shopping for. One of those things... accessories. With all the fantastic and incredible accessories out there how does one narrow it down? Well look no further loves. Today we are bringing you 8 must have accessories that you need in your life now. Oh, and the best part is that we are sharing this with you right before Valentine's Day so treating yourself or emailing/texting your significant other a little hint (links included!) is now so much easier. I Am Very Busy Phone Case - The color is perfect. Who doesn't love mint and gold? This is also a great way to have others back off when you are on the phone..."I am very busy" dammit leave me alone! A phone that speaks for itself. Mint Pearl Double Sided Earrings - Double sided earrings are really popular right now and it's pretty obvious why. Being unique and chic make them stand out above all the rest. Rose Gold X Ring - These X rings make us smile, and why shouldn't they. We know you love 'em too! Black Embossed Python Bag - Not only is this bag stylish, but it can be personalized and monogrammed. So this is just a no brainer for us. Is it bad to admit that we want to collect these in every color? Brass Bar Necklace - Personalize this delicate looking brass bar necklace and make a statement. This necklace is also perfect for layering another necklace or two to compliment any outfit. Tassel Key Chain - Add a little touch of class to an item that you carry around constantly and are sometimes over looked...your keys! Monogram this baby to give it a personal touch. Glitter Dipped Coffee Mug - Coffee is a daily necessity and without it I'm not sure I could function as early as I do in the morning. This Lady Boss mug is perfect for pumpin yourself up with your daily dose of caffeine in the a.m.
Catch All Dish - This catch all is perfect for a night stand or where you get ready in the morning. Not only is it adorable but it is also ideal for holding jewelry, glasses, or or chapstick before turning in for the night. 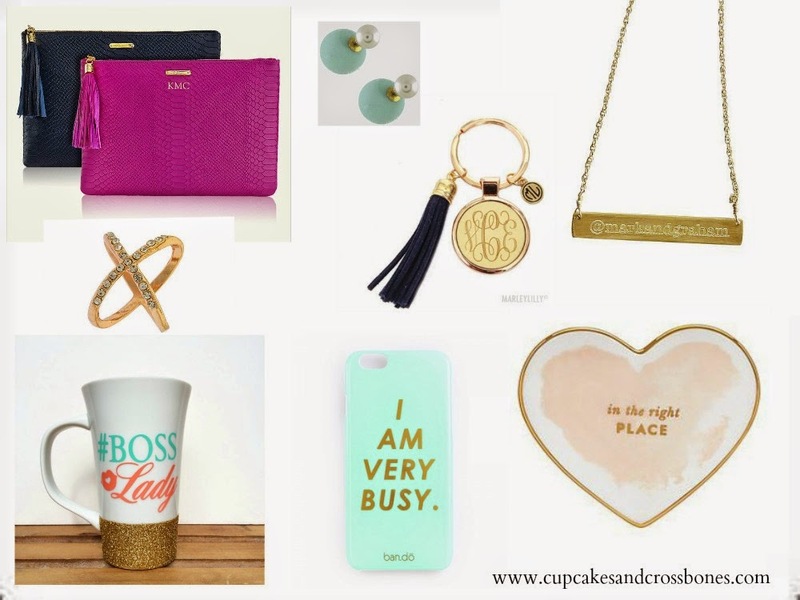 Which accessory is your favorite and which one is a necessity for you? i have the bar necklace with my twitter handle on it! The phone case is cute! You know me though the mug is adorable! Yes! Mugs are my weakness too! Right? We knew we had to have it when we saw it! Isn't it awesome?! I love it and use it constantly! Agreed! That is so sweet and means the world that you thought of Cupcakes & Crossbones! thank you!! Yes to the gorgeous clutches!! I've been wanting a Gigi New York one forever now! And that bar necklace is a must have. I have one with our wedding date on it and wear it almost every single day! The clutches are def a classic piece that will stay in style for years to come. Love that you have the bar necklace with your wedding date on it!